For years, residential and industrial designers have been using concrete stamps to decorate and add style to their projects. While the basic concept is not new, recent advances in technology have allowed stamp manufacturers to offer more diverse choices for their clients. Brickform offers a light stone texture with well-placed fractures, making it appealing for indoor and outdoor applications. To further diversify their offerings, many concrete companies have been stamping their work with decorative designs that depict sunbursts or even animals. “Our new stamp design is our new Seamless Texture design tools,” says Larry Freeman, vice president of sales and marketing for Proline Concrete Tools. In 2008, Proline began offering a full line of “style” stamps, including such designs as a spiral sun and a jumping marlin. Each stamp will have what Freeman calls a hand-carved appearance. Proline’s new Seamless Texture design stamps have designs actually built into the seamless texture mats to make a beautiful appearance quick and easy. 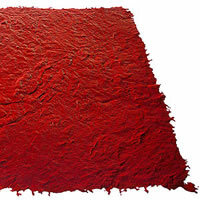 Speaking of hand-carved, Matcrete is now offering concrete stamps that look like wood. “We have a four-piece wood-grain stamp set we are making with Wayne Sellon of Tajmawall,” says Matcrete’s Kris Kaitanjian, noting that the details even include knots and cracks. 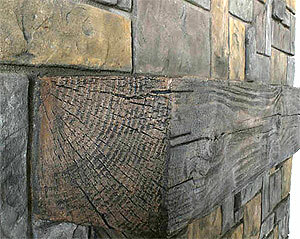 Matcrete’s new wood-grain stamp set includes details such as knots and cracks that would occur in natural timber. Another set of fabricated “natural” surfaces are the slates offered by L.M. Scofield Co. Some companies are growing their line to simplify the process for contractors. “The main changes I have seen are the addition of more colors and larger stamps to save on labor,” says Steve Cook of Kraft Tool Co.
Kraft’s decorative texture mats leave a three-dimensional impression that includes details of the shape and texture of natural stone or brick. Another means of simplification is offered through Butterfield Color’s new lines of stamp tools that allow contractors to install decorative borders without spending time and energy carving them by hand. “Butterfield Color’s real-life experience as installers allows us to produce tools that simplify the stamping process for contractors and respond to specific design requirements of the architect and landscape architect,” says Butterfield owner Joe Garceau.